I was late to Croatia, a country now topping countless tourism “it” lists and last year attracting a record 17.5 million visitors. But I was also right on time: to investigate the reopening of an iconic Dubrovnik property, Hotel Excelsior. 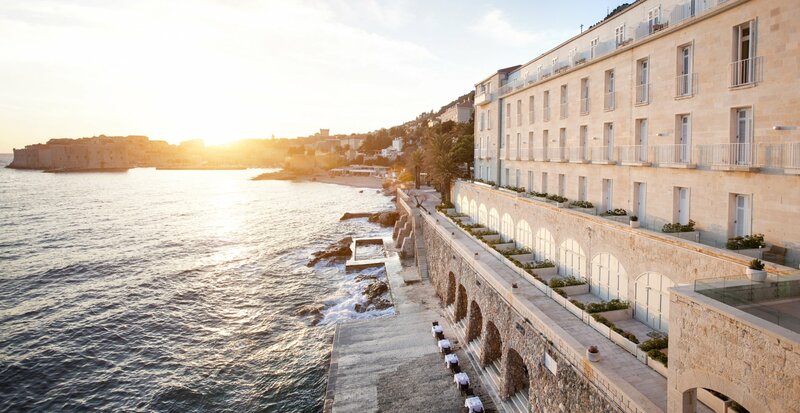 One of the 12 Adriatic Luxury Hotel properties to be newly renovated this Spring, Hotel Excelsior is the perfect way to experience Dubrovnik, a city so stunningly picture-perfect you’ll have trouble remembering it’s real. One word: contrasts. Dubrovnik, a UNESCO World Heritage Site, seems lifted from an ancient fairy tale. Hotel Excelsior, in a century-old building, looks as sleek and modern as they come. It’s an unexpected yet delightful combination. Walk into the minimalist reception area and you won’t notice the hotel—which is just the point; dramatic floor-to-ceiling windows showcase what you’ve come to Dubrovnik for: a flawless view of the sea and the famous Old Town. Style and flair come in the lobby downstairs, a sprawling, inviting space decked out in understated gray and brown tones and pops of vibrant color, complete with funky custom-crafted décor. Only the black-and-white photography on the walls says “ancient”—until you step out on the grand terrace and there it is again, on perfect display: the Old Town and the Adriatic Sea. There are 158 rooms and suites yet Hotel Excelsior still has the feel of a boutique property. I was instantly at home in my suite, with its minimalist-chic look, windowlight oak floors and modern area rugs. The best part was the terrace and its Instagram-ready view. Every evening at sunset I—like every guest, it seemed—donned my bathrobe, poured a glass of Croatian wine and settled into the terrace for nature’s crimson-colored show. The Old Town is magnificently beautiful but it can also be a tad overwhelming, with its tourist hordes and Game of Thrones tours, so it was lovely to return to my quiet room every night and be serenaded by the soothing symphony of sea outside my window. Breakfast comes with yet another stellar view at indoor-outdoor Restaurant Salin, where the buffet is extensive and the Chef’s Special Omelette, made with truffle paste and brie cheese, wowed me. Lunch at Prora Beach Restaurant is traditional Mediterranean and very fresh: fish carpaccio, lobster with homemade pappardelle, sea scallops with pesto and white wine sauce, plentiful salads. The Abakus Piano Bar serves up signature cocktails like the Texas Mule, with vodka, ginger beer and mint, but what it really serves up is the best sunset cocktail hour in Dubrovnik. Follow that with dinner at Sensus, Hotel Excelsior’s new fine-dining flagship. Offerings include ravioli with sweetbreads, truffle, prosciutto chips and local sweet white wine sauce and a “trilogy” of white fish served with vegetables and spinach macaroon. No sand but plenty of loveliness. Along the hotel’s cliff-beach are lounges and ladders, offering easy access to the sea. Stroll next door to uber-popular Banje Beach for the sandy experience, along with local DJs and divine local oysters. The Energy Clinic Spa offers an extensive menu of treatments, including an anti-fatigue espresso facial, a foot spa, an “Islands in the Stream” treatment that involves a scrub, lavender oil, and hot and cold compresses, and an Energy Clinic Fit Figure package with body brushing, serum application, and a massage. The mountain lookout point overlooking Dubrovnik is well worth a visit, but you should hike up—it takes about an hour and it’s a hearty but beautiful trek—then take the cable car down. Make time to enjoy live music on the streets of the Old Town; from corner to corner I took in everything from jazz to traditional Croatian folk music to violin covers of Celine Dion. And definitely pop into the best discovery of my trip: Soul Caffé in the Old Town (Facebook.com/Soul-caffe-Dubrovnik-176880629090013/). I was lured in by the sound of live classical guitar and the Charlie Chaplin silent film projected onto a back wall, but what kept me there—aside from the delicious local wine being served—was the narrow bar’s welcoming owner Antun, who’s part host, part philosopher, part Croatian historian.